Note that profits doubled from 1998 to 2009, yet the S&P 500 index today is still lower than it was at the end of 1998. The second chart shows profits as a per cent of GDP; note that profits by this measure have almost recovered all the losses that occurred in late 2008. 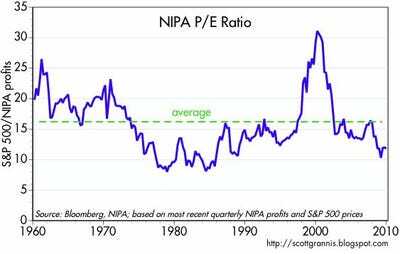 By any standard, the corporate profits picture is very bright. Basically, the Price to Earnings (PE) ratio has halved over the period. 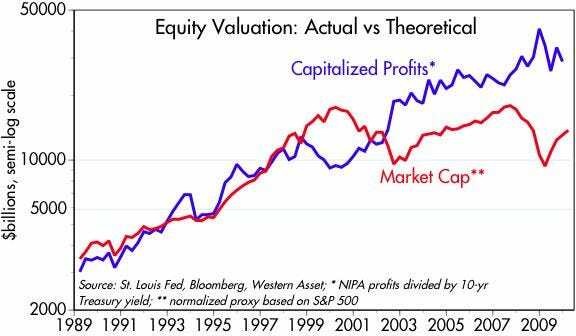 The chart [below] uses the normalized value of the S&P 500 index as the “P” and after-tax corporate profits from the National Income and Products Accounts as the “E”, in order to calculate a PE ratio… Note that this very simple model of equity valuation correctly identified how cheap stocks were throughout the 1980-1998 period, and correctly flagged the grievous overvaluation of stocks in 2000.